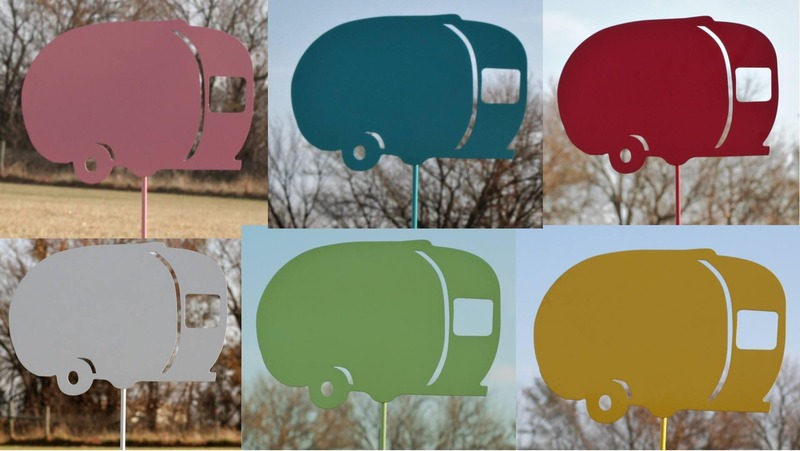 Customized Metal Camper Stake is a great gift! Excellent for any occasion from birthdays to retirement! 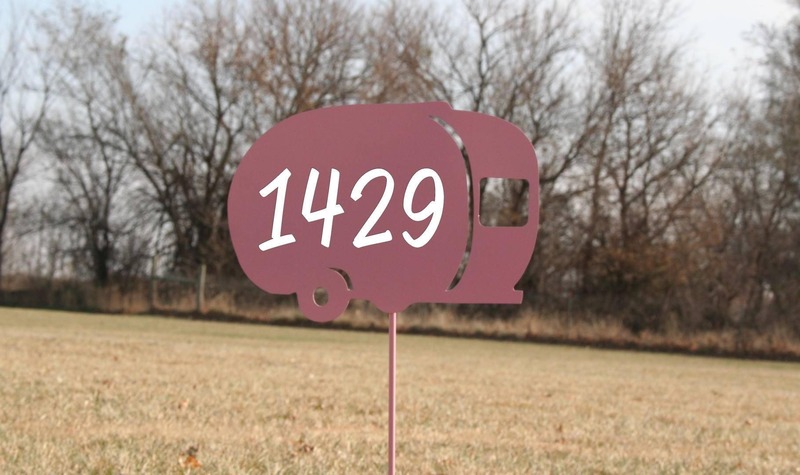 This adorable color stake is perfect for your landscape or for the RV site. The metal stake is 24" tall and 12" wide. Very sturdy construction. Your choice of vintage style colors are combined with white or black outdoor-safe vinyl. 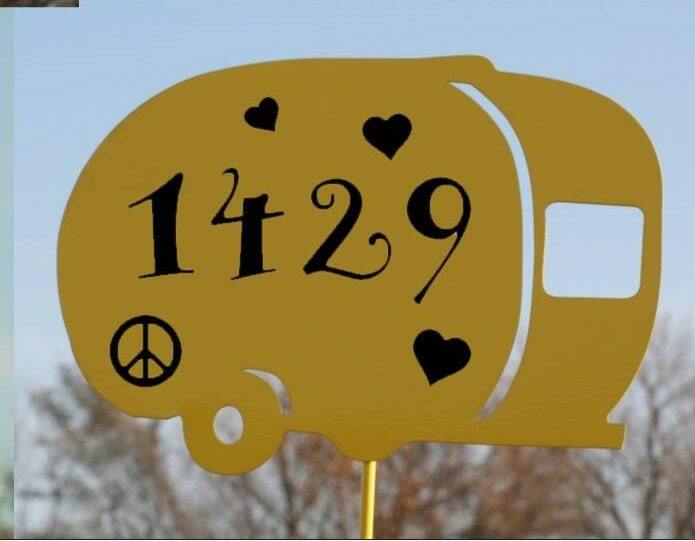 White, Silver and Yellow signs will have black vinyl for best visibility. Red, Pink, Blue and Green signs will have white vinyl unless otherwise requested. 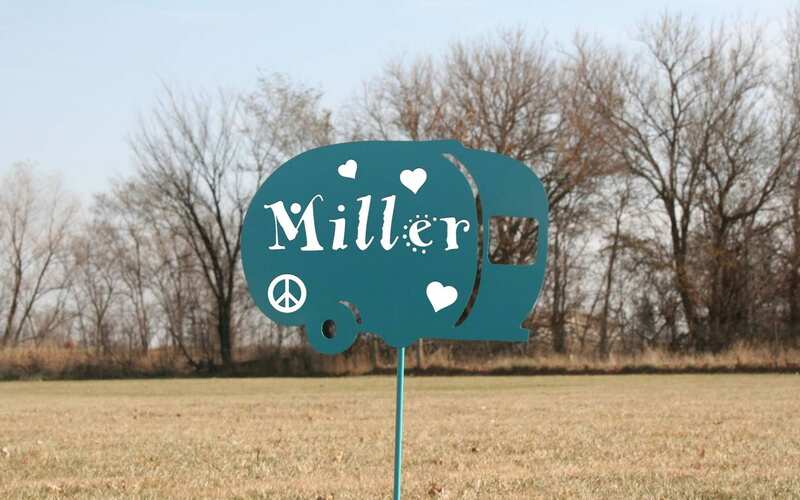 This charming stake will add vintage character to your yard or garden. 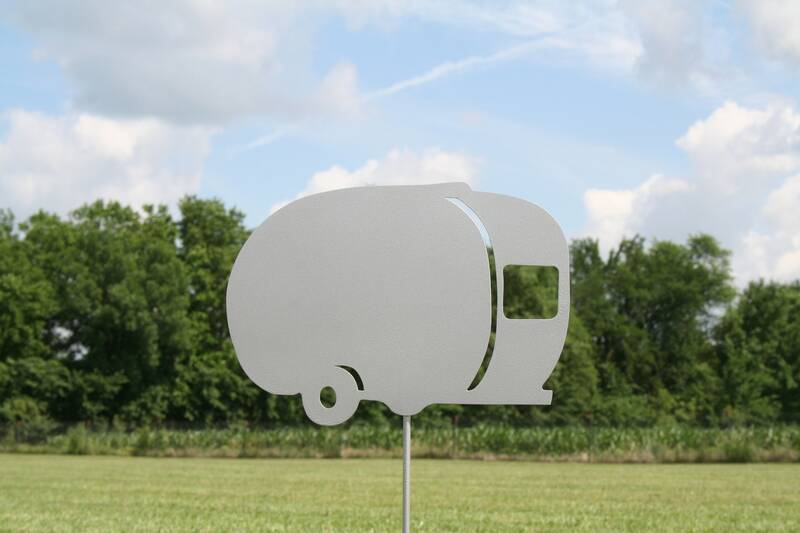 Take it along to the campsite! 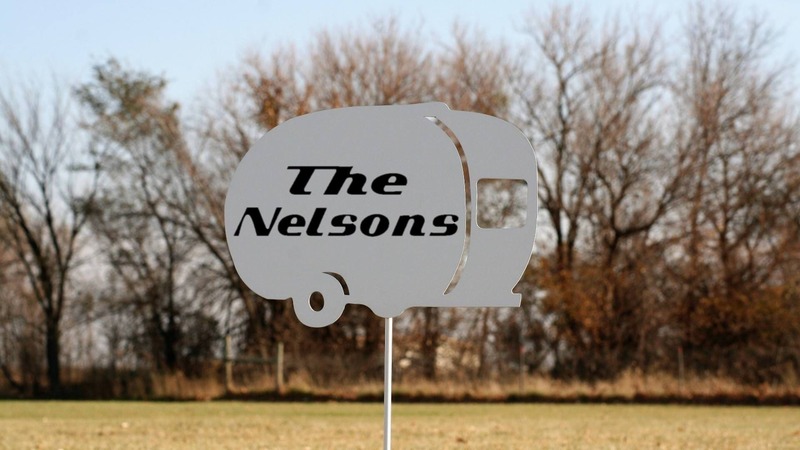 The RV is cut from durable, thick steel and welded onto a rod for a sturdy, lightweight yard sign. Powder coated in durable fade-resistant coating. Sure to last for many years to come! Choose your layout from the designs in final photo. At checkout you will have a chance to leave a "note to seller" with your name, number or message up to two words. 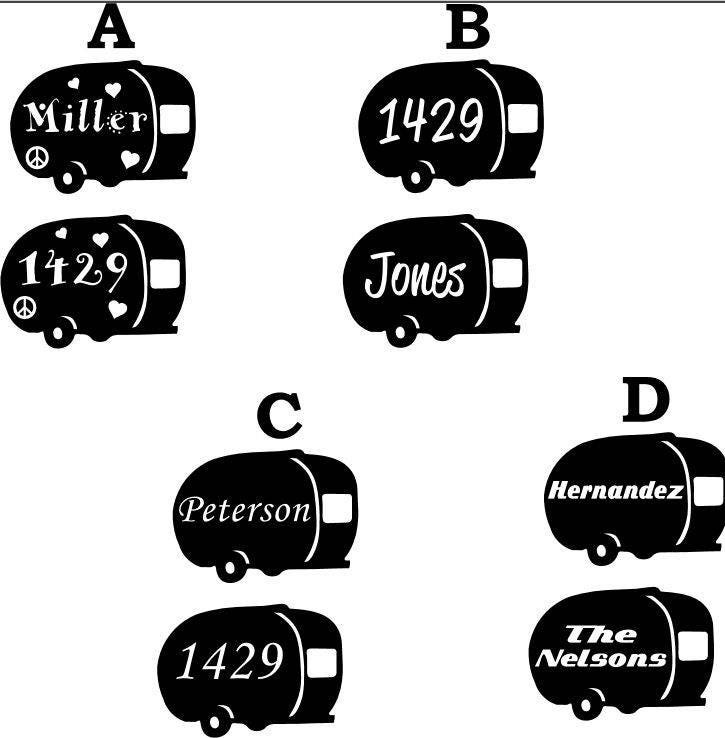 Text will only appear on one side of the camper. We hope you love our garden stakes as much as we love making them! All of our products are made by the two of us, in our own shop. 100% made in USA and made to last! 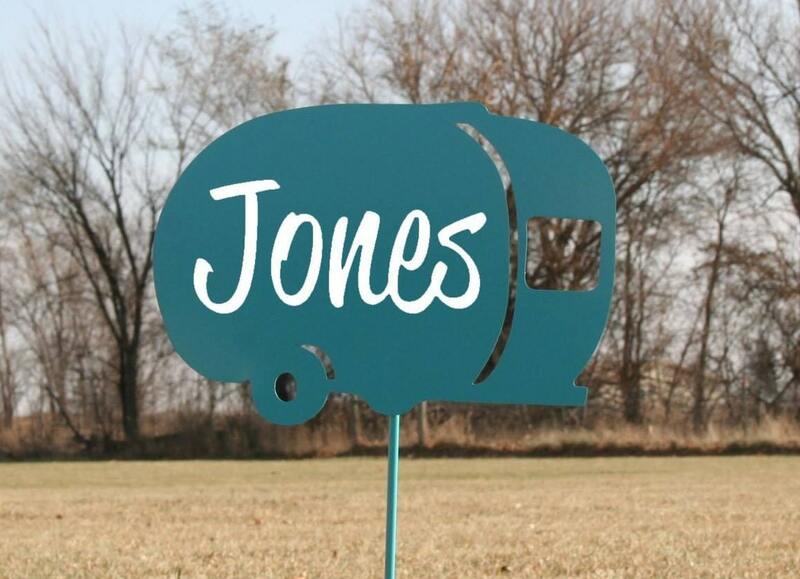 Please contact us if you'd like to personalize one of our non-custom items. 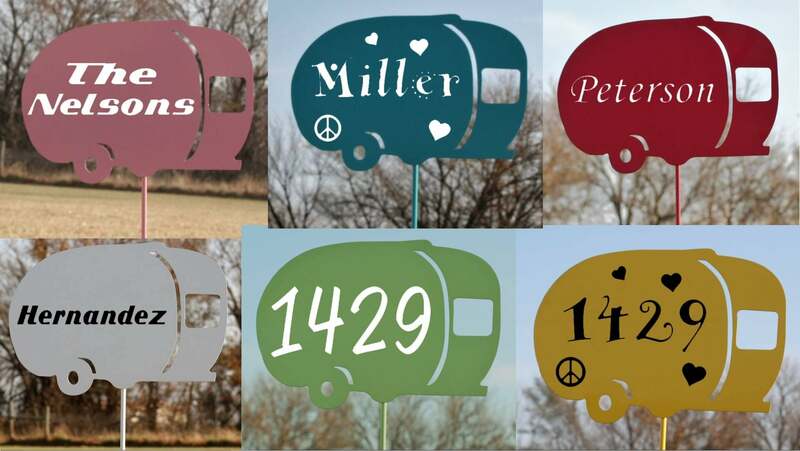 If you're ordering a custom piece like an address sign please remember to include your personalization info in the area to "leave a note" at checkout. Sizes are listed in the description. If we've missed sizing information please contact us, so that we can correct our mistake! Thank you. No special care is needed! Rinse with water if dirty. Rusted items are safe in all weather. No need to bring them in for the winter. 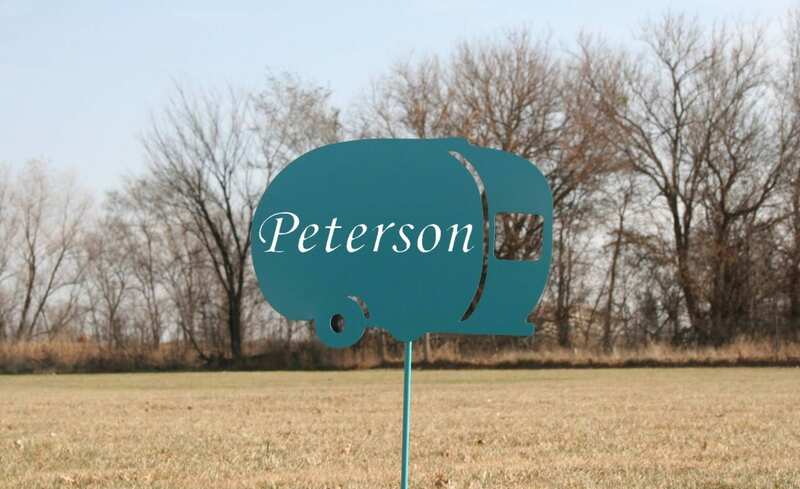 Powder Coat is a very durable finish. Safe in all weather. If needed it can be washed with soap and water. Do not use an abrasive pad. Treat this finish just like your car. After 6 months of drying time it can even be polished or waxed. Safe outdoors in any weather. Will not fade or peel like spray paint. If needed our painted signs can be washed with soap and water using a soft cloth. Do not use an abrasive pad. We do not offer gift wrap due to the size of our items. Gift wrap will not survive the shipping process in an attractive manner. Can I send this item as a gift? Yes, you can ship items directly to a gift recipient. Please be sure to enter their address correctly during checkout for a seamless transaction. Will the price be displayed if I send this item as a gift? You can select to ship the item as a gift. A packing slip will be printed with your item, but it will not include any pricing information. Can I send a gift note or a card with the order? We do not offer hand-written notes or cards at this time. You can enter a gift message to your gift recipient during checkout. This message will be printed on the packing slip which also does not include any pricing information. During checkout you'll have a chance to type a note. Please enter text exactly as you would like it to appear on your customized items.